When Narendra Damodardas Modi became the prime minister of India in 2014, he was also expected to play the role of a magician. The economy was crumbling thanks to the policy paralysis of the earlier dispensation. The BJP as a party was itching for a revamp and to replicate the 282-seat feat in all the states. The enormity of corruption of the UPA government, indulged in with impunity by those holding high offices in government, bureaucracy and the party, left a sense of hopelessness and despondency among the people. 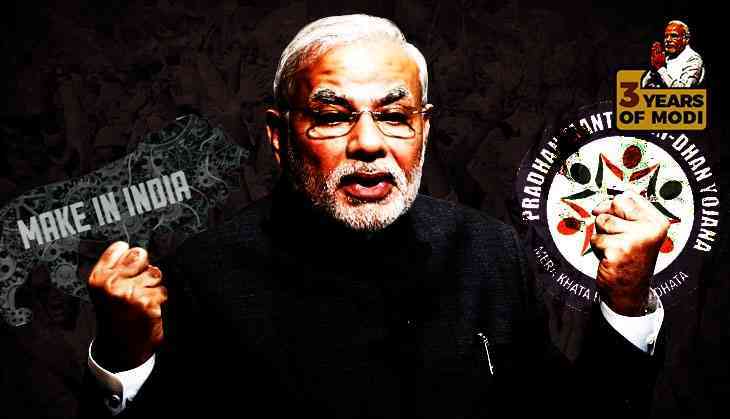 Modi’s ascendancy to power was a foregone conclusion. The main challenge was not power but how to face the mounting challenges. Expectations ran high, but there was little doubt about Modi’s capability to meet all challenges and accomplish everything that was expected of him. The only area where people anticipated a slower kick-start was the foreign policy where a chief minister was not expected to be experienced enough to know the diplomatic nuances. But ironically enough, Prime Minister Modi has surpassed expectations and surprised everyone. Modi invited all the neighbouring heads of state for his swearing-in ceremony, akin to holding his first regional conference on day one in office, thus sending strong signals of his robust foreign policy direction. India’s neighbours have occupied much of New Delhi’s attention in its overall foreign policy matrix since the Independence. Modi’s foreign policy strategy, therefore, was fundamentally aimed at protecting the country’s core national interests – safeguarding territorial integrity and sovereignty, and achieving economic prosperity. It also was aimed at simultaneously tackling the most significant challenge of regional imbalance, military asymmetry in the region and New Delhi’s oscillation between soft and hard power options. The lack of a comprehensive neighbourhood policy strategy, superpower interventions and dearth of understanding of security challenges and relevant actions blurred India’s prospect of becoming an effective regional power and play a pivotal role in emerging Asia. Asian consolidation and emergence of an united Asia is feasible if the three powers – India, China and Japan – work in unison. The fact is that given the strong undercurrent of history and civilizational perspectives, they do lack the initiative to work in harmony. By virtue of his deft moves in foreign policy, Modi has mastered the art of balancing between Beijing and Tokyo, not getting caught in their crossfire and yet securing India’s bilateral gains and interest. Needless to say, these foreign policy engagements are commendable even for a work in progress. China’s forays into the Indian Ocean region, the China–Pakistan Economic Corridor (CPEC), the One Road One Belt (OROB) and many other moves by China will continue to demand strong policy changes from the Modi government. Developing effective mechanisms in the near term for regional cooperation on non-traditional security issues may yield rich dividends in the long term. It will also allow India to move towards resolving some of the region’s long-standing chronic security problems. There is an urgent need for an in-depth and comprehensive study that will examine opportunities for cooperation on shared non-traditional security concerns as potential building blocks towards developing a viable regional India-centric security architecture. The foreign policy perspective of a country is the sum total of events and experiences of the past and the geopolitical realities of today. While the neighbourhood remains an important element in foreign policy formulations, the global strategic discourse has changed to building multilateral and intra-region and inter-region strategic architecture. As of now, as has been the practice since Independence, the PMO is heading the foreign affairs related policies and actions. It will add to our success if foreign policy, strategy and national security is also discussed and debated in the Prime Minister’s National Security Advisory Board (NSAB) which will also be able to bring new talents and ideas. As a three-time chief minister of an economically strong Gujarat, Modi’s real best performance is evident in the government’s economic policies. The element of surprise and determination in the demonetisation initiative, the introduction of series of incentive schemes on banking and insurance aimed at inclusion of the poor and the marginalised sections are only some of the successful projects helmed by him. Industrial output is expected to go up as a result of all the measures aimed at ease of doing business. Even the World Bank has taken cognisance of this and has upgraded India’s ranking in doing business in the global competitiveness index as well. As a result of fast clearance of stalled projects embroiled in corruption, not only is domestic investment likely to go up, the but road and rail connectivity and other infrastructure projects will also be put on the fast track. The trimming of deficit and subsidies, merging the railway budget with the general budget and tax reforms concluding in the adoption of GST are path breaking steps on fiscal governance. – Effective controls to stop further generation of black money without of course jeopardising small and medium business. While foreign investment is likely to pour in, care should be taken to provide a level playing field to domestic investors and proper technology transfer for long-term benefits. The banking sector needs an urgent overhauling to tackle the mounting non-performing assets (NPAs) and also fiscal consolidation. Rural electrification has clocked new milestones but urban power woes continue due to state governments versus the Centre crossfire. Ujwal DISCOM Assurance Yojana (UDAY) is a successful step to revive failed DISCOMs and getting states to accept the strict norms is no small achievement. Yet the going seems to be slow as far as the use of an alternate source of power is concerned as also the use of solar power in urban areas and the industry at large. Skill development and vocational training have got a strong push in these three years. This is likely to ease the unemployment situation which looks scary and threatens to nullify economic benefits. The government's thrust should be to encourage entrepreneurship and steer the economy from an employment-oriented one to the manufacture-based one. The introduction of the Kisan credit card system, farm insurance, grow and locally sell produce and other major reforms in agriculture will certainly help mitigate the farmers' woes. While inflation is under control, farm output pricing seems to be a troubled area controlled by middlemen and an exploitative rural money-lending system. The best part of the three-year evaluation of the Modi government is the report brought out by the NDA government itself. In the absence of a strong and responsible opposition, the Modi government has done well to highlight not only its achievements but also has flagged its shortcomings and areas where the government needs to be alert and carry out course correction. This certainly augurs well for our democracy.